Google Earth Pro es ahora gratis ~ Business Intelligence y Big Data: ¡Aprende Gratis sobre Analytics! 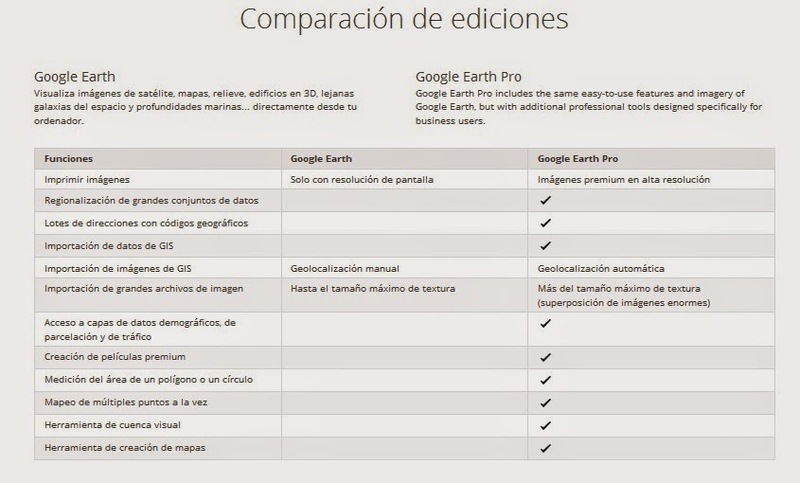 "Google Earth Pro, the premium version of Google's popular Google Earth service, is now free"
Esta es la frase mágica. Antes costaba unos 400 dolares al año. La versión Pro, comparada con Google Earth trae herramientas que facilitan la vida. Over the last 10 years, businesses, scientists and hobbyists from all over the world have been using Google Earth Pro for everything from planning hikes to placing solar panels on rooftops. Google Earth Pro has all the easy-to-use features and detailed imagery of Google Earth, along with advanced tools that help you measure 3D buildings, print high-resolution images for presentations or reports, and record HD movies of your virtual flights around the world. Startingtoday, even more people will be able to access Google Earth Pro: we're making it available for free. To see what Earth Pro can do for you—or to just have fun flying around the world—grab a free key and download Earth Pro today. If you're an existing user, your key will continue to work with no changes required.